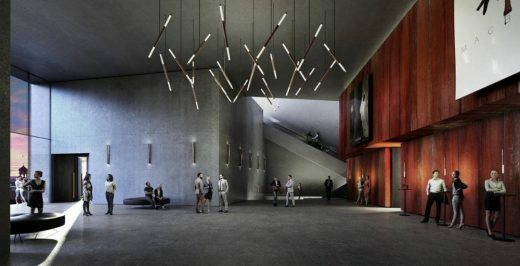 The National Theatre of Albania is a 9,300 sqm contemporary venue designed to host local and touring theatre companies in the nation’s capital. 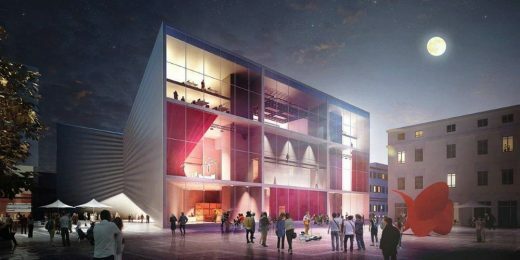 Located in the cultural and administrative heart of downtown Tirana, adjacent to the iconic Skanderbeg Square, the National Opera and the National Art Gallery, the cultural space will replace the existing theatre and add three new indoor performance spaces, a rooftop amphitheater as well as a covered public space underneath the building. “Tirana is going through an era of unprecedented transformation and innovation. The city is becoming greener with a major tree plantation drive of 2 million trees! It is a leading child-friendly and pedestrian city with countless playgrounds and large car-free areas as the Scanderbeg Square and New Bazaar. Tourism has also grown 2.5-fold in recent years as a leading city-break destination. Alas, BIG’s new theater will become a crown-jewel of this transformation in the heart of the capital! The “bow tie” will tie together artists, dreamers, talents and the aspirations of a city going on fifth gear yearning for constant change and place-making,” Erion Veliaj, Mayor of Tirana. 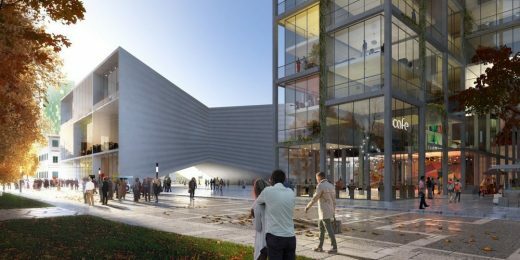 Located prominently on the cultural axis and in a mostly pedestrian zone, BIG’s design for the National Theatre of Albania seeks to reclaim and reinforce the city’s goal for more urban gathering places in Tirana. 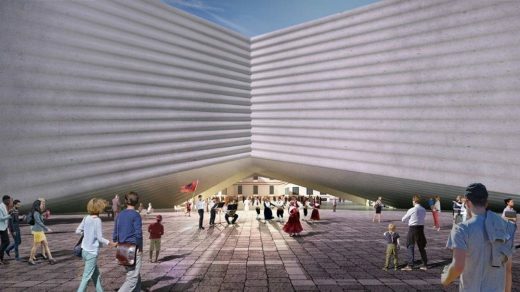 The prism shaped volume is compressed and lifted in the center, creating connections and public plazas on both sides of the theatre at street level. Visitors and theatre enthusiasts can enter the building from either side or simply stay under the arch of the building to enjoy impromptu performances and other cultural events. 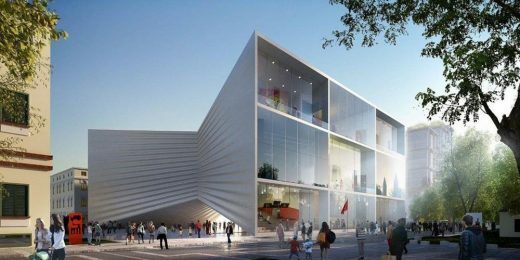 “Our design for the new National Theatre of Albania will continue the city’s efforts for making Tirana’s public spaces more inviting and its public institutions more transparent. The theater is conceived as two buildings connected by the main auditorium: one for the audience and one for the performers. Underneath, the theatre arches up from the ground creating an entrance canopy for the audience as well as for the performers, while opening a gateway to the new urban arcade beyond. Above, the roof mirrors the archway, forming an open-air amphitheater with a backdrop to the city’s skyline,“ Bjarke Ingels, Founding Partner, BIG. Once inside the building, visitors will have access to immediate ticketing which is flanked by two grand stairs that lead up to the theatre foyer. From there, guests may continue up to the main auditorium or into the smaller black box performance spaces. The program organization of the venues informs the bow tie-shaped volume on the outside: the main auditorium is located in the middle, sandwiched by the front-of-house activities facing south, and all of the back-of-house activities and services to the north. The facades on each side of the building reveal the interior program to passersby outside, creating a storybook for the public and allowing the theatre operation to act as a stage in its own right. A rooftop venue and cafe are accessible to the public as well. The sloping of the roof creates an amphitheater-like space that is framed by a dramatic backdrop of the city itself. 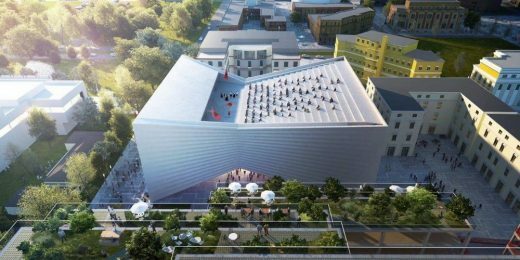 With open venues, one sheltered and one with a rooftop view,—and traditionally hidden theatre spaces being revealed out towards the city—the New National Theatre of Albania will be both stage and actor in the city of Tirana. BIG’s cultural center experience includes the recently completed 12,000 sqm LEGO House, bringing Billund a step closer to becoming the Capital for Children, the 2,800 sqm TIRPITZ ‘invisible museum’ that transforms a historic war bunker into a cultural complex in Blåvand, and coming soon this year is 12,300 sqm MÉCA, three cultural institutions united under one roof in Bordeaux, France.